The next day, there will be another guided meditation, and another opportunity to Sit With Bodhi. If you don’t want to follow that meditation on that particular day, that’s no problem. The meditation will stay on your phone until you’re ready. The Bodhi Mind app was launched just over a year ago, bringing you a library of Bodhipaksa’s guided meditations. 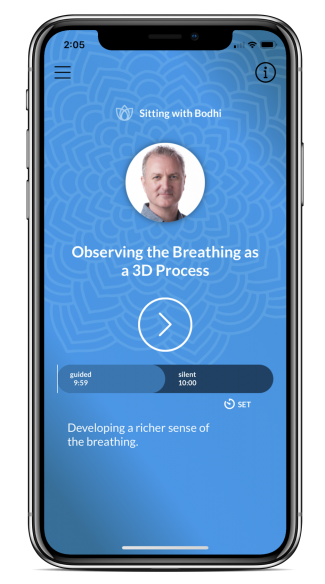 At the moment there are 300 meditations, covering basic mindfulness of the breathing, lovingkindness and compassion meditations, and practices for awakening insight. As you listen to the Sitting With Bodhi meditations they’ll be added to your library so that you can return to them later. The Bodhi Mind app also allows you to add meditations to a favorite list, and to download tracks for offline listening. The app is free to download, so you can test it our to see if it’s for you. There will always be content available to you even if you want to stick with the free version. And if you want continued access to Sitting With Bodhi and the entire library, there are inexpensive options to subscribe monthly, annually, or for a lifetime.